I was asked to write a story for a food magazine, sharing my collection of mortars and pestles and as I started bringing them out one by one to style and photograph, I was reminded of this smoked or grilled tomatoes and avocado mash that I make whenever I get a few fully ripe avocados, using a mortar and pestle of course. I would admit that I rarely get such nice avocados in Delhi, the last I ate great avocados was when I brought a few from Kodaikanal hills where I had gone for a work assignment with a health resort coming up in a coffee estate. They grow peppers and avocados along with many local fruits as mixed farming practice in their organic coffee estate. 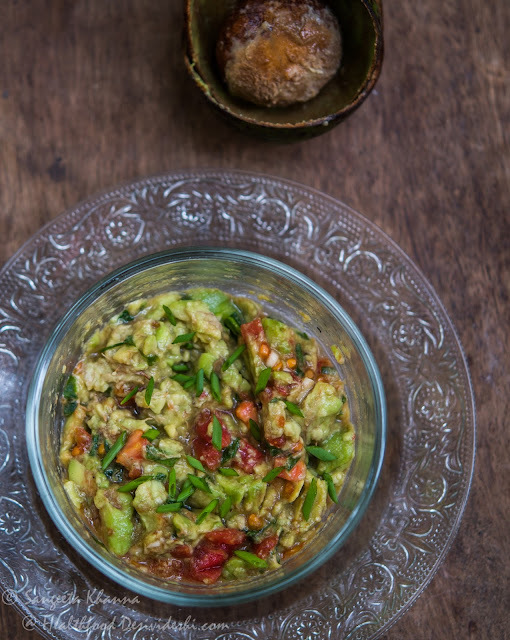 This smoked tomatoes and avocado mash is the best thing you can do to your avocados, I find it better than the guacamole, or may be it is my love for baingan ka chokha speaking. Similar textures, similar seasoning but a very different taste that makes this mash a favourite of mine. Grill the tomatoes over gas flame or barbecue grill till the skin is charred and pulp soft. Peel the skin off and chop the tomatoes roughly. Cut into half, remove the pit and empty the pulp of avocado in a mixing bowl or wide mortar. Add the chopped smoked tomatoes and all the other ingredients and blend with a wooden pestle or a sturdy fork. Serve cold or chilled as a dip or mash. 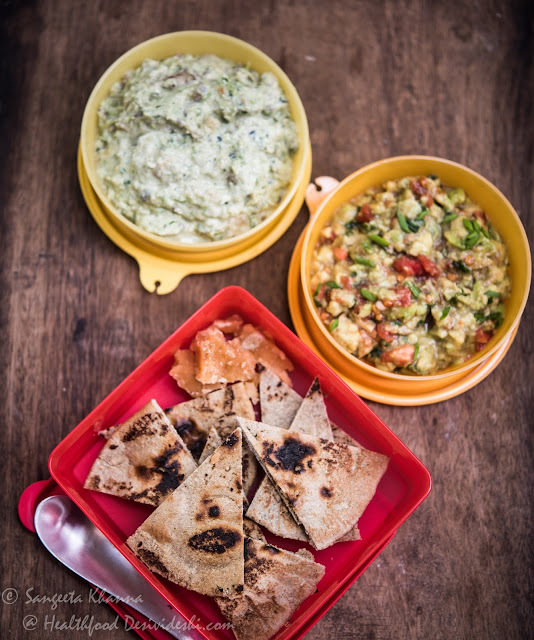 We love this mash as a spread for our multigrain pita sandwich or as a dip for our bajra roti too. Try this smoked tomato and avocado mash sometime with bajra roti, you can come back and thank me right here. You can serve another dip made of hung yogurt and grated cucumber seasoned with roasted cumin and red chili and see how everyone starts asking for more.